Most industries rely on compressed air in some form; indeed, it’s often referred to as ‘the fourth utility’. However, while most businesses will keep a tight track on how much electricity they are using and energy efficiency, quite a few don’t monitor the efficiency of their air compressors and, as such, may be losing money. Leakages in compressed air systems are a relatively common issue and can cost companies a lot of money in wasted energy. While most air compressor systems will be subject to some leakage, any leakages under 10% of the compressor’s capacity aren’t considered problematic by industry standards. However, anything over this figure and you could be facing a real problem. There are a multitude of reasons for an air compressor leaking but one of the most common is poorly fitted components such as pipes and hoses. 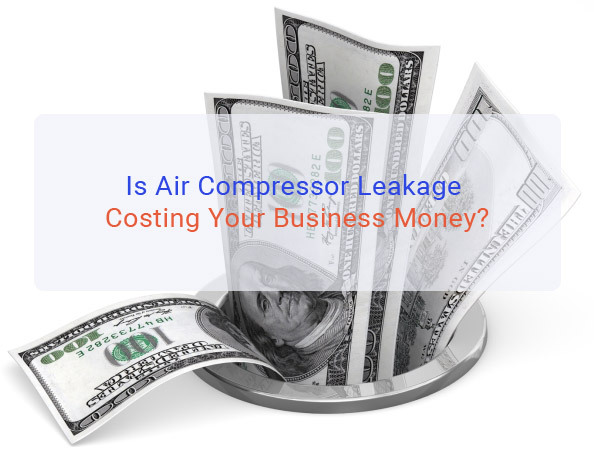 The implications of a serious leakage can be quite severe; you’ll find that the equipment your compressor powers operates less effectively, while it can also affect the lifespan of your compressor. Undiagnosed leakages can also lead to companies investing in unnecessary new equipment in order to try and increase the amount of power their system is producing. Detecting a leak in your system can be quite difficult, as most leaks are invisible as well as inaudible to the human ear due to the high frequency of the sound caused by leaking air. One of the telltale signs that you have a leakage is if your equipment is running less effectively than usual, while measuring the output of your compressor against its regular output should also provide some clues. The best method to definitively diagnose a leak however is to use an acoustic detector, which will be able to pick up on the sounds of air emitting that your ear can’t. This equipment makes use of microphones, amplifiers and audio filters to confirm leakages in your system. Actually fixing a leak can be as simple as tightening the fixtures of your compressed air system, although it’s advisable to call in a service technician to do this for you. It can also be the case that some of the equipment you are using is faulty, the solution to which is a simple like-for-like replacement. However, not all solutions are this simple. Poorly applied sealant can also be the cause of leakage, in which case you’ll need to reapply the sealant to make sure no air is escaping. This can be quite a complex task so again, call in a qualified service technician if you’re unsure. Of course, the best action to take against leaks is to prevent them before they occur. Make sure you’re subjecting your equipment to regular maintenance checks and have an agreement in place with professionals on air compressor servicing. Always adhere to the scheduled dates for services, as missing them can lead to issues building up in the future at great expense for you in terms of time and money. It’s also worth making sure you have a warranty on any compressor you buy.